Honeywell"s Voyager 1202g single-line laser scanner incorporates the freedom of Bluetooth wireless technology and offers a field-replaceable battery that can be quickly and easily exchanged. The new Voyager 1202g delivers the aggressive linear barcode scanning that users have come to expect from the world-renowned Voyager family of scanners. Used over multiple shifts and multiple people - easy to use. I use the scanner to check books in and out of a small library. I also use it to inventory my books. 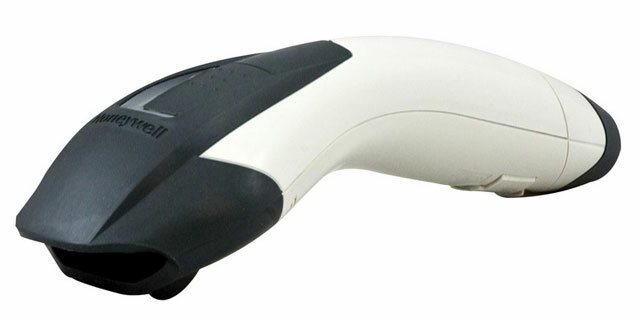 This is our first wireless barcode scanner, and so far we are very satisfied. It is completely plug and play with a PC, but not so much with a Mac. In order to get it to work with a mac, it requires some programming which I wasn't able to perform very easily, so we are just going to use it on our PC computers. The build quality of the unit itself is excellent, very high quality plastic, nice bright illumination of red/green indicator lights, and the ability to hang it on the wall is a nice touch. Our only issue with this unit is that it doesn't ship with an AC adapter, and the charging is done exclusively through its USB connection. This means that in a facility where your computers are forced to "sleep" after a period of inactivity (we are a "green" campus), the USB port also goes to sleep and stops charging the barcode scanner. This sometimes results in finding the scanner with too weak of a charge to use it wirelessly the next morning. This does exactly what we need it too. It's comfortable to hold & scans items all day long. Very easy to use. Very practical. There isn't too much to say about this product that isn't already advertised. It works perfectly and fulfills all my needs. 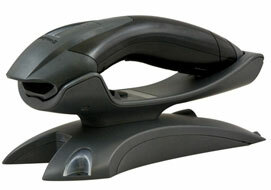 Wireless scanners are fantastic if your scanning work needs to be done on the move and not tied down to a desk. This unit has great range and a fantastic battery life. Lithium-ion batteries are a must. I'm also fond of the ability to use programming codes with this, specifically adding suffixes and prefixes. Seems to be a durable product too, nothing feels flimsy or cheap. This actually sped up my last audit by 30% so I would absolutely recommend this product to anybody in need of a good wireless scanner. 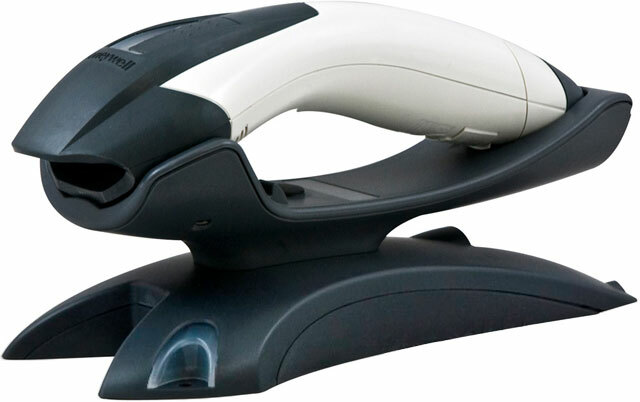 I believe there is an upgrade model that supports 2D barcodes, but if you don't need it, this is the scanner for you. I was looking for a simple cordless scanner for several months. Finnaly I called Barcodes Inc. Juancarlos the rep recomonded this Voyager 1202g scanner. I went ahead and ordered one of them. Our inventory library project staff loved it and asked me to order one more and I ordered one more. Then they asked me to order two more. Now we have four (4) of the same model. This scanner is very simple to use. Great for weeding or inventory projects in the library or any other company. Has bluetooth which works great for tranfering data to the computer. We love it. Have 4 of these, and they work great! Use these everyday in retail setting. Work great. No problems. Just wish the USB line came out the top. We were looking for a wireless hand held bar code scanner that was comparably priced to the wired scanner we had been using. This one has worked out very well. It is reliable, easy to use, easy to install, and keeping it charged has not been an issue. We routinely use it up to 12 feet from the base/computer it is installed on. (Previously, we had very LONG cords!) We actually ordered one, used it for several months to be sure we were happy with it, then ordered another one. Learning to "aim" it at the bar code did take a little getting use to as projects at a strange angle, which is why I only gave it 4 stars. Once you have used the unit a while, it stops being an issue. This makes taking my inventory hours faster, more accurate, and an overall improvement for my business. we use this to read the vehicle identification numbers from automobiles for input to our inspection maintenance program computer. Speeds up the process tremedously. great product as we upgraded from a wired metrologic scanner and all i needed to do was plug it in and scanner worked seamlessly with no setup required. Quick shipment, what I ordered. The staff was very helpful on getting the right product. The Honeywell 1202G-2USB-5 is also known as HSM-1202G-2USB-5	or 1202G2USB5	.